With regard that stand-off in Nevada, it appears the FAA declared a no-fly zone around the property. A rather small one (3 miles radius, and 3000 feet and below altitude above ground). 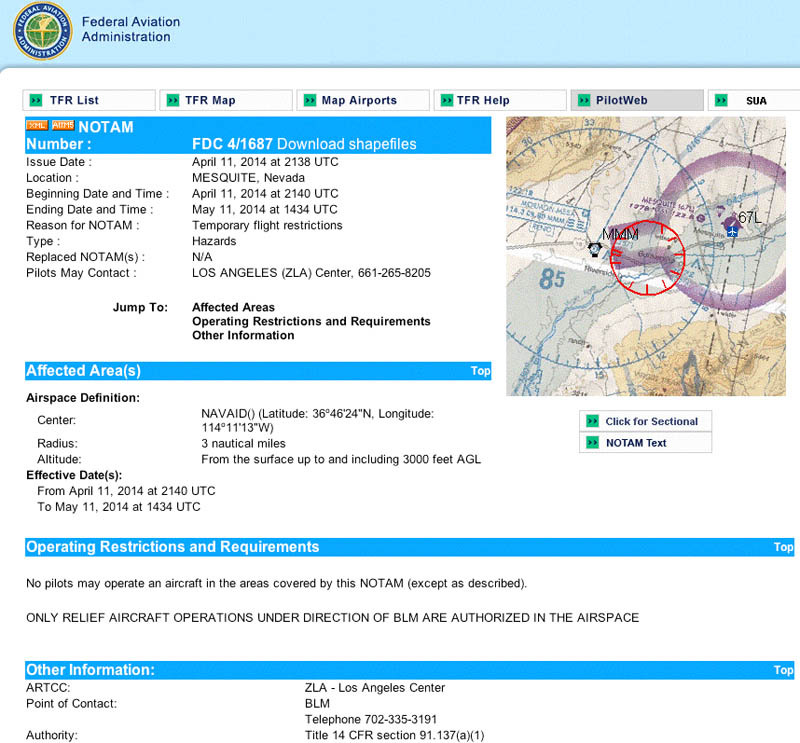 with an exemption: "ONLY RELIEF AIRCRAFT OPERATIONS UNDER DIRECTION OF BLM ARE AUTHORIZED IN THE AIRSPACE"
UPDATE: I suspected they'd delete the page, so here's a screen pull. I'd like to point out that in 1787 during the original Constitutional Convention, it was offered that Congress would have the power to regulate stages on the post roads. That offer was dropped and no power over vehicles was ever granted to Congress. The federal government simply took, usurped, the power. If one reads the debates of the Convention of 1787, one finds many things like considering giving the President the power to suspend laws temporary and killing that thought, considering letting the federal government set up temporary governments for new states created out of the territory and killing that, like considering having a select militia, i.e. national guard, and killing that, and even considering letting Congress set their own salaries with Madison saying we can't do that the Congress will be too self-interested. What I am saying is that most of what the feds do was considered and withheld from them. There is no authority to regulate vehicles of transport, or to have a national guard, or to allow the President to NOT enforce laws, or to form new states with special requirements for admission. All this and much more was considered at the Convention and voted down or simply left to die. If the Framers considered a topic and did not add it to the Constitution, the federal government has no authority to exercise that power. Ours is a government of granted powers not one of implied or inherent. Study the granted powers and note that not even related powers follow by implication. Note that many of the explicitly granted powers are extremely narrow and that all related power are also explicitly granted. Some of the Bundy supporters managed to get a small plane up Thursday for aerial reconnaissance, wherein they found the corrals the BLM had set up had about half the cattle the BLM claimed to have captured. Presumably the FAA declaration stemmed from that sort of effort. An ideal situation for a remote controlled "drone."